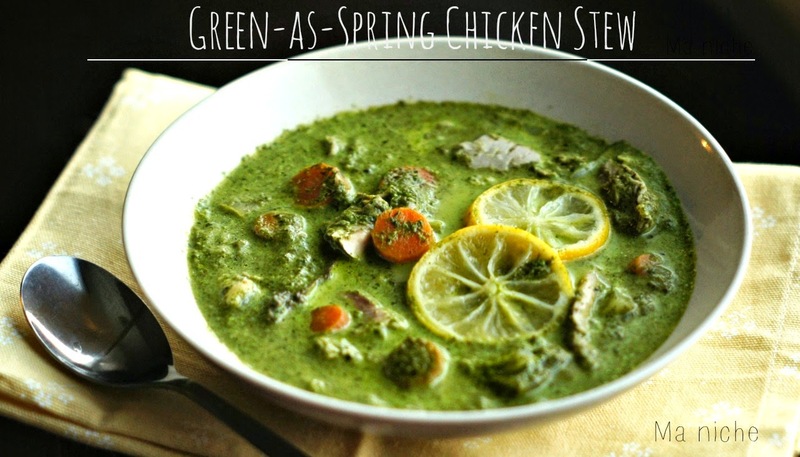 This week the Doristas were assigned to cook Green-as-Spring Veal Stew. We do not eat veal, so I tweaked the recipe a bit and cooked a green chicken stew instead.... I almost followed Dorie recipe, except that I left out the tarragon and returned the veggies into the pot of simmering green sauce along with the meat. I thought the orange of the carrots and the greens of the leaves and herbs presented a pretty contrast. Husband disagreed. He did not like the green at all.. though he thought that the soup was nice. I thought it was lovely. The dill and the lemon was very refreshing and the stew as a whole paired wonderfully with plain rice and Aloo bharta, a Bengali style mashed potato, that we had made to go with it. I guess the toddler felt the same way for he ate his chicken and rice without any fuss. From experience I have learnt that chicken recipes do not need as much lemon juice as veal ones. So I reduced the amount of lemon juice in the stew and added slices of lemon as garnish. That way I could squeeze in the extra juice I wanted and husband could steer away from it. In a large vessel, bring the chicken broth and water to a boil. Drop the chicken legs, cover and simmer for 30 minutes. Stir in the carrots, celery, onion, garlic, 1 teaspoon of thyme, bay leaf, salt and pepper, lower the heat to a gentle simmer, cover and cook the vegetables along with the chicken legs for 45 minutes. With a slotted spoon, scoop out the chicken legs and vegetables, cover and keep them warm while you make the sauce. Toss in the arugula, spinach, coriander, dill and ½teaspoon of dried thyme in the liquid that is left in the pot. Cook the greens till the leaves wilt. Switch off the heat, let the mixture cool down slightly, then puree them in the blender. Return the green sauce to the pot, stir in the heavy cream and 1 tablespoon of lemon juice, adjust the salt and pepper and simmer the mixture for 5 minutes. While the sauce is simmering, pull off the meat from the chicken legs and slice them into bite-size pieces. Finally return the cooked vegetables and the chicken pieces into the pot, simmer everything for 5-7 minutes. Switching off the heat. Then garnish with lemon slices and serve with rice or noodles. Visit French Fridays with Dorie to know what the other members thought about this stew. 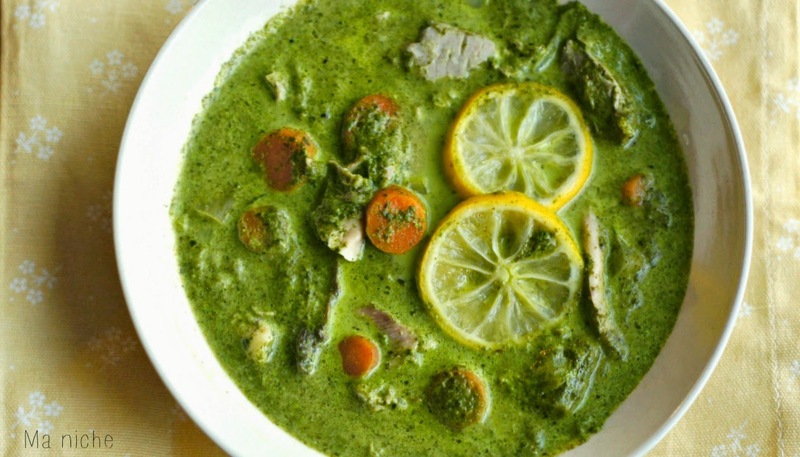 You can find Dorie's recipe for Green-as-Spring Veal Stew here. For more such delicious recipes order your copies of Around my French Table and join the Doristas in this tasty adventure. So pretty! I like how you presented this dish. Love love your presentation of this dish, pretty amazing! If I ever make this sauce again, I will leave my hubby's turbo blender alone! Your stew is so pretty - mine is nothing like so pretty. You did a great job with presentation…yours looks quite appetizing! 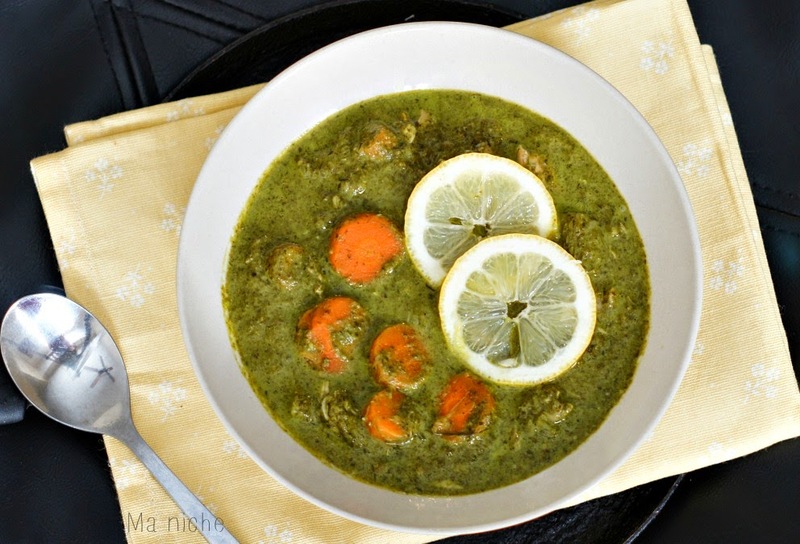 I love the combination of arugula, spinach and dill for this stew - and chicken sounds like a tasty alternative to veal in this case. Perfect for spring indeed! its perfect for the weather and season too. I love the color! Thanks for linking up with Hump Day Happenings! Yummy! I've never seen a stew like this before.